What better way to relaunch my blog featuring young talents than celebrating one of my own! My 12-year-old son, Luca, is a passionate dreamy young man who sees and plays the world in a very special and unique way. Here’s a short video of him practicing two of his favorite pieces, played his very own way. It’s been almost 3 long long years since I updated this blog! I, however, have been visiting it very frequently, reading all posts over and over again, remembering the great minds I had the chance to meet, teach, inspire and empower (hoping they still remember me), and fighting a growing desire to reactivate it. In truth, I stopped writing here on purpose, and sometimes even thought of deactivating my blog, because its purpose existed no more. It was meant to celebrate the talents and skills of the great young minds I encountered when I was a teacher and lost contact with when I started my own business. It might not seem like a valid convincing reason, but this blog was never about me, it has always been about them… Without their input, their talents, their minds, and their creativity it will struggle to survive defeating its own purpose. But despite all that, I was never able to shut it down! The emotional connection I have with it is particularly tremendous. When I’m here I feel like skimming through an old family album filled with great memories and beautiful people. Every time I talk about it or read its content I feel nostalgic, proud, happy but also sad. I miss it a lot, I miss the passion that drove me to start it, I miss the strong belief I had in the young minds, I miss the enthusiasm and creativity of those I taught and inspired me. I miss the great sense of achievement and pride I had when succeeding in making someone believe in his or her talent and potential, and eventually draw, snap, paint, write or develop something… I miss me 5 years ago. It feels great to be back… Good night, and see you soon! Could it be Love? A ‘Good Heart’? A ‘Spell’?! I have always wondered how people get repeatedly ‘fooled’ by the exact same person, the exact same way, and manage to have the exact same astonishment and disappointment every single time! And what’s even more amazing (and frustrating for that matter) is that they never have a tiny doubt of what was going on until very very late!! The amount of hurt and misery they go through every single time is tremendous, the state of shock is great, the reaction is violent, the ‘big’ decisions are firm, yet the exact same history repeats itself, over and over!! Assuming all the above, one may (or may not) understand people falling in for other (same) people’s bad intentions and actions more than once, but I just can’t understand how they manage to be equally shocked, hurt and disappointed every single time! Any thoughts regarding this mystery/misery? Interference in other’s business and personal life is an invasion of the other’s private space. Watching someone drowning or ruining their life without being able to interfere is an invasion of all rules of humanity, compassion and care. Life is Fair, People are NOT! What’s unfair is poor kids not being able to go to school because there is not enough space nor enough education in public schools! What’s unfair is poor people dying because they have no cash and no support! What’s unfair is teenage girls being forced to get married to lift some weight off their care takers’ shoulders! What’s unfair is kids losing one or both parents only to find they lost all their present and future with them! What is unfair is being indifferent to and totally uninvolved in what could be fair to others! What is totally unfair is to blame it on life when life should blame it on you! For me, no one can be successful in isolation from his surroundings. I can only be successful through the success of everyone around me, no matter my or their size, power or influence. Success can only be real when it makes its beholder and those surrounding him shine inside out! In one of his amazing lectures, Benjamin Zander said “I have a definition of success. For me, it’s very simple. It’s not about wealth and fame and power. It’s about how many shining eyes I have around me”. I couldn’t agree more! I can only feel my worth as a mother, a teacher, a friend or a manager when the eyes of the people around me shine! And there is no way I could do that if my own eyes do not truly shine! 15-year-old Nada Al Dash is celebrating today a valuable heritage embraced by a particularly old building she felt connection with the moment she noticed. All she could see from its cracked walls and weary condition is authenticity and beauty. 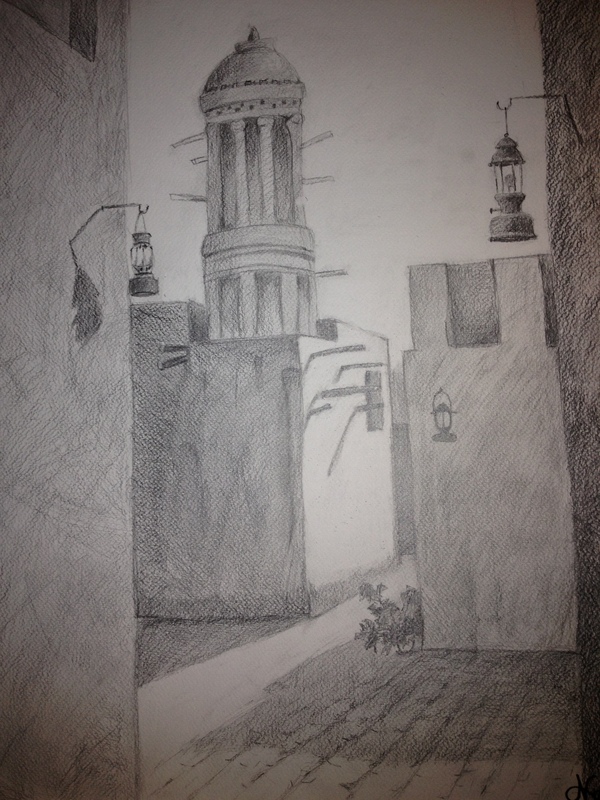 Here’s a drawing of that building she would like to share with us! Enjoy!